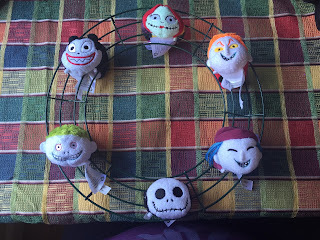 Nightmare Before Christmas is a Halloween favorite, so we're making wreaths out of Disney Tsum Tsums. 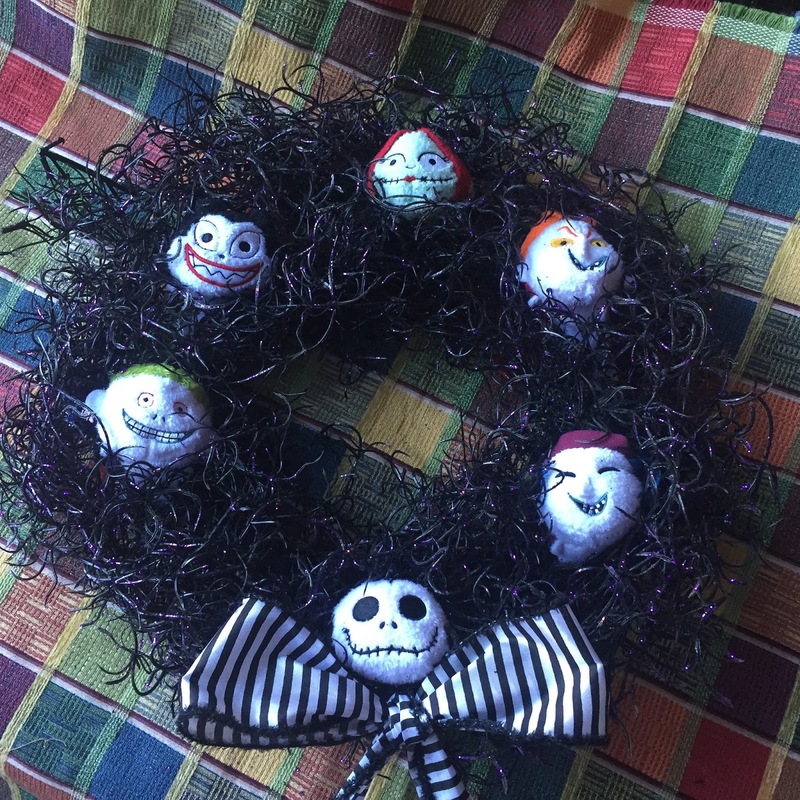 These wreaths are easy to make, so let's get started. Flip over the wire frame so the back of the frame is toward the table. Take your Tsum Tsums and push the back of the first Tsum Tsum into the wire and pull it through half-way. If you want you can take your needle and thread and sew the Tsum Tsum in place. If you want to free the Tsum Tsum for playing later, skip the needle and thread. 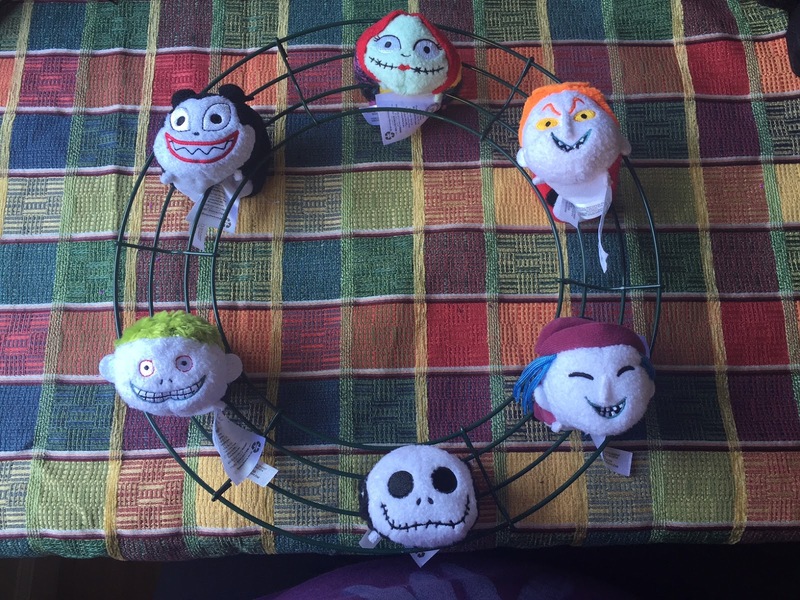 For the wreath above, I used six Tsum Tsums, one for every section of the wreath. For the Lock, Shock and Barrel wreath below, I put them at the 9 pm, 12 pm and 3 pm spots on the wreath. Here you can see how the Tsum Tsum fits through the wire. Take the thorn garland that you've already attached to the wreath and place it around the wreath on the outside but still facing front. Arrange the garland so it's covering the wreath frame. For the second row, take the garland and arrange it on the inside circle of the wreath. Arrange any overage to cover bare spots. Now cut four inch wire pieces with the wire cutters. Use the wire to secure the thorn garland by looping it through to the wreath frame with both ends of wire coming out the back. Twist the wire to fasten the garland to the frame. I did this about twenty times to fully secure the garland. Keep checking the front of the wreath to make sure that there are no bare areas. Tie your ribbon into a bow and attached by threading a piece of wire through the bow's center loop in back and twisting the wire around the wreath.